Hello everybody! Hope this weekend was very relaxing and/or fun for you. Today I’m just improvising this post, since I took a few photos of Maya today and I thought it would be a nice topic to talk about. So let’s talk photo edit. 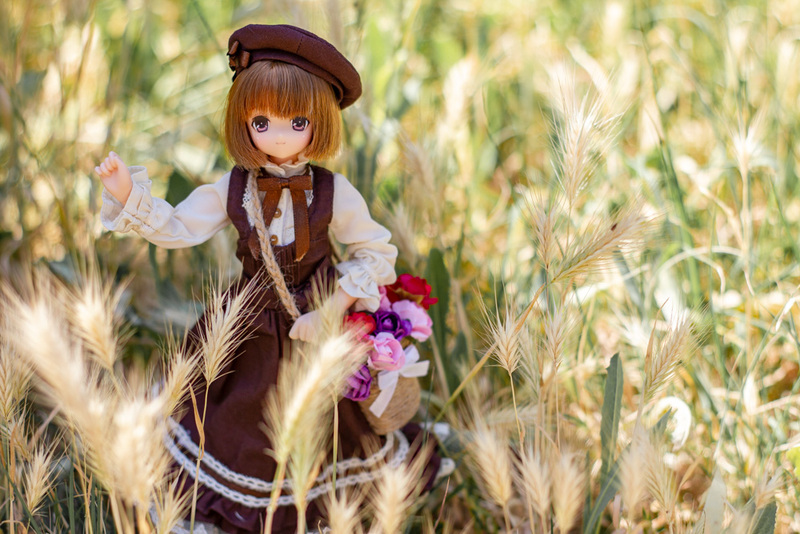 When I first got my Canon T2I (camera I’ve been using since the beginning of my doll adventure) I knew I could shoot RAW with it, meaning the camera would make bigger files that contain a lot more info than a jpg (which is a compressed file). Being the newbie I was, I tried it for a few shoots and then went back to my good old jpg, I just didn’t feel it was worth the trouble of converting the files later on. After a while I decided to give RAW a chance again, so I started shooting both jpg and RAW at the same time, but most of the time I ended up editing the jpg and ignoring the RAW completely. I’ve been editing from RAW for a while now (maybe 2 years), but it’s only been a short while since I truly saw what an amazing difference makes. I’ve played a lot with Lightroom since coming back to the hobby, and I’ve learned a lot more. My edits have gotten better too and I know what I can and can’t do, more or less. 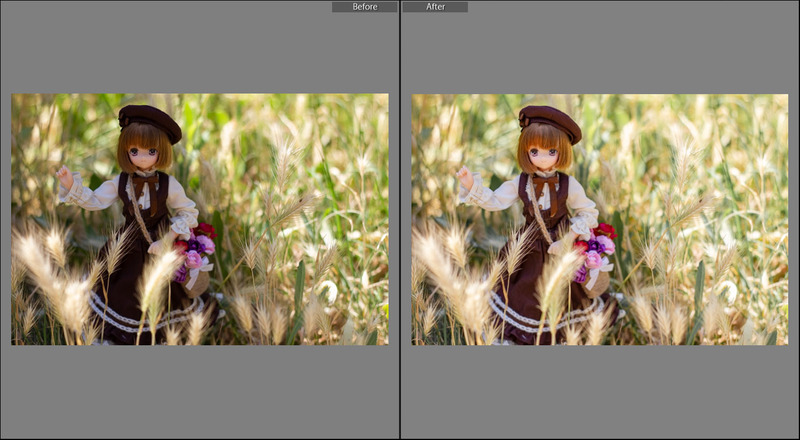 This won’t be a Lightroom tutorial, but I thought it would be fun to show a few before and after pics. Hopefully in a year or so I’ll look back at it and realize I’ve improved since. This is the photo I took today. 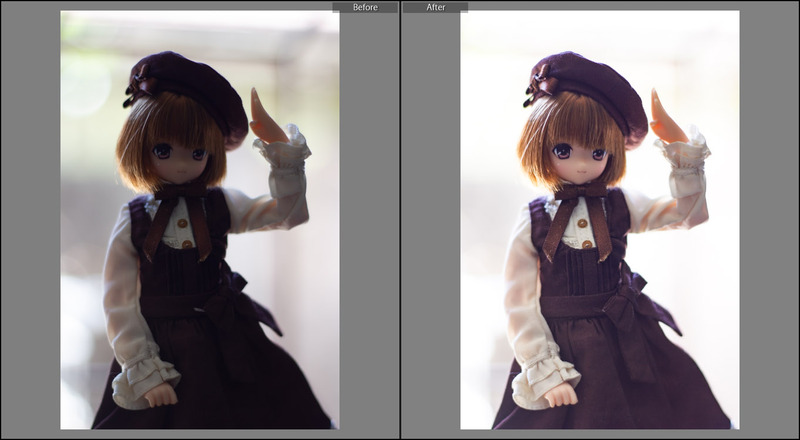 Left is RAW file as taken from the camera, right side is the edited photo. Not a huge difference, but here’s the thing: you won’t always need much edit on a photo to make it pop. I upped the exposure, lowered the highlights and tweaked blacks and shadows mostly. I also lowered the saturation of greens in the photo, since I felt the vibrant green of the grass was a bit too overpowering. I quite like the result. I didn’t edit further in Photoshop since I didn’t feel the need. Sometimes I take the final photo and make some other tweaks on Photoshop, usually any edits that require cloning (like when I remove the doll stand from the photo so it looks like the doll is standing on its own). Here’s another example. You can see a lot more difference here between before and after. And my favorite photo of this month so far. 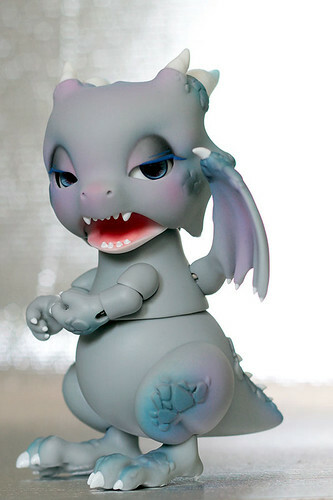 I purposely took this photo with the light source (a window) at the doll’s back, making her face dark. The plan was to up the exposure in Lightroom so the background would be almost completely gone. This clothing set has quickly become a favorite, Maya looks so cute in it! I hope to keep learning stuff, I’ve been watching some neat tutorials this week, I’ll try to put some in practice soon! What about you guys? Do you edit your photos? I would love to know! Photo editing can be fun and irritiating at the same time. 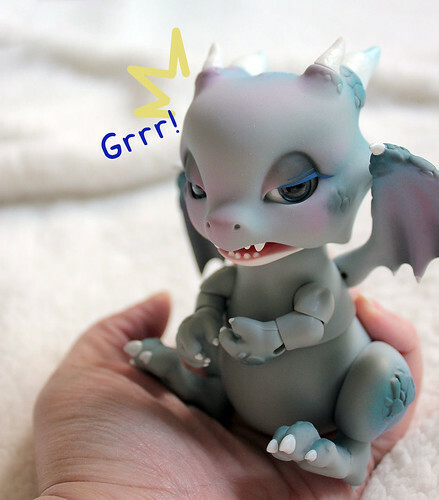 I make some changes mostly in Photoscape. 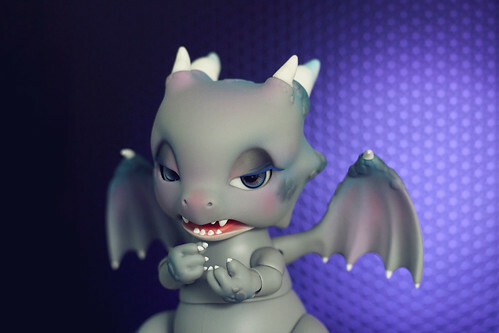 But I have to get newer version of Photoshop because mine doesn’t have a tool to correct distortion. I also have to give RAW a chance and perhaps play with HDR mode. Yes, Maya is a lovely model and those clothes suit her. And she would look great in mori or natural kei style. Both Lightroom and Photoshop are great tools and it’s not too expensive to pay the monthly fee if you only gonna get those 2. I’m a graphic designer so I work with various other programs as well, so it can be pricey. Speaking of photo editing – I’m trying to avoid that as much as possible. 😀 It’s just so time consuming work. So I always try to take photos that needs only cutting, changing the brightness or contrast, sharpen… Of course it’s not always possible. And sometimes I wish I made something better. I think everything is valid!! I like my photos to be bright, and sometimes it’s just not possible without a bit of tweaking. I think your photos are very nice, I’m impressed you don’t do much on them. I don’t usually do too much, it doesn’t take me more than 5 minutes including cropping, but I’m trying to pay more attention and be more intentional with the edit I do on them.And I never pick more than 2 photos from the same session, sometimes I just edit one. I’m not great at posting several photos of the same shoot, not sure why, it just happens haha. I’m very glad you like the photos, I don’t think I’ve ever taken this many photos of dolls in such a short period of time ever before, hopefully I’ll keep improving. You are absolutely right. Sometimes you need some help to make the photo look right. But I discovered recently how useful a reflector can be. 🙂 It helps a lot with the light from the behind of the doll. And I’m impressed you can choose 1 or 2 photos only! I wish I could find 10 photos I liked from a single photoshoot, but it hasn’t happened yet haha. Maybe I should aim to take even more photos, though it’s kinda hard outside, since my camera viewfinder works terribly under daylight, I just can’t see a thing. I have to trust the autofocus is doing it’s job and shoot as many angles as I can to ensure I get one decent photo. My camera is kinda old at this point, but I don’t have any plans of changing it, it still makes great quality pictures. Ohh I wanna try lightroom, I usually use photoshop so i’ve never actually bothered with it. That back light trick is great, it works even better if you have a reflective surface in front of the doll, since it creates a real halo effect! Lightroom is great, it has very nice tricks! 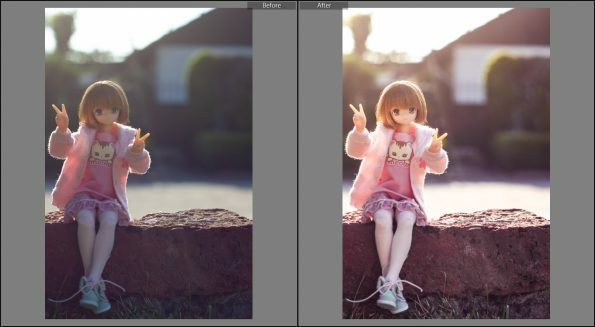 I’ve tried my reflector for back lit photos and so far I’ve never liked the result, but I just need to keep trying, I might change it to a bounce card, maybe the reflector is too big for such a tiny doll. Thank you for sharing your tips on editing and using RAW and jpg files. My camera has the ability for RAW too but I don’t seem to take photos in that format, mostly because I can take more photos using jpg and because I edit it in photoshop anyway, I never bothered with it but I might have to try it out one day. I have heard RAW is better but I guess because it’s just hobby photography for me, I haven’t really been so diligent with it. I really need to learn how to use my camera better but I hate reading the manual, lol! I know I’m hopeless! As for editing, I always edit my photos, not a lot as some turn out the way I want but for others, I may have to edit heavily if the colours, light and shadow aren’t right and always when I take photos under artificial light as I hate the yellow cast it gives to photos. Anytime!! I think I’m going to make more of these photography posts, I liked writing it, even though I didn’t give much tips. With RAW files you have a lot more control editing light and colors, because the jpg has lost part of that information so you can’t rescue as much when lifting shadows or trying to change a single color’s saturation. 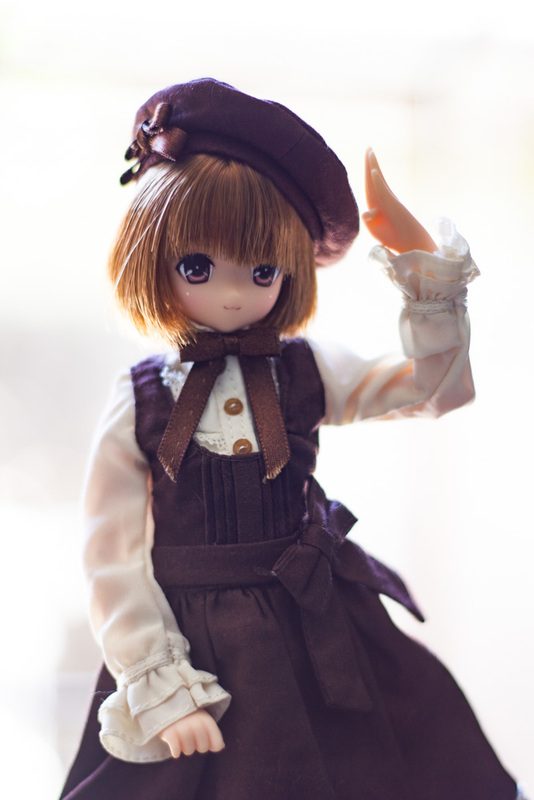 I think after all these years I’m finally starting to understand it, and I’ve been taking doll photos for 6 years! Who likes reading manuals anyways? LOl!! I haven’t bothered reading mine either, I was lucky to have a small photography class in University (it was only a semester). You are right, some photos do turn out great right off the camera, and it’s wonderful when that happens. That said, I really like your edits too! I enjoy reading about photography, but I must admit to still not knowing enough to take a decent photo. I also enjoy editing, but more for fun than to I improve my skills. Thanks for sharing your tips and the before and after photos…maybe one day when I’m not so lazy I’ll get into taking RAW photos. I like your photos!!! they are always very cute and you know how to tell a story through them. I feel I lack in that, but I would like to try someday. Editing can be fun, it doesn’t matter why you do it, it’s still a part of your process and that’s good. Not editing is also good. It’s a hobby after all and we should make whatever feels better with us. Hope you give RAW a try one day, it might surprise you! Or maybe not haha. Great post and good information about editing photos. I mostly use apps on the phone or on my computer. If I really want to take some amazing photos, I hit the brick wall. Or call for my oldest daughter, who has a digital system camera. So far this works for me, because the camera on a smart phone can be rather good in great daylight. And then there is a lot of extra materials with tiny lenses too. But it would be great to learn to use different apps in more ways. Something for me to work on during 2019, maybe! Apps are good too! I’ve tried a few but I always go back to Photoshop, but that’s mostly because I’m not much of a phone person haha. You’ve made such a difference in these photos with your editing. I have to be honest and admit that I am hopeless with my camera settings and mainly just use the automatic ones and then when it comes to editing, I just use Picmonkey. Sometimes I’m frustrated but then I just lump it because I haven’t a clue what I’m doing! I don’t even know what RAW means. But I will google it! Maybe I should make 2019 the year that I learn to photograph and edit properly?